To facilitate the economic, social and cultural exchanges between Guangdong and Hong Kong, the Governments of both sides agreed to introduce ad hoc quotas to provide private car owners with an additional means of transport to cross the boundary. 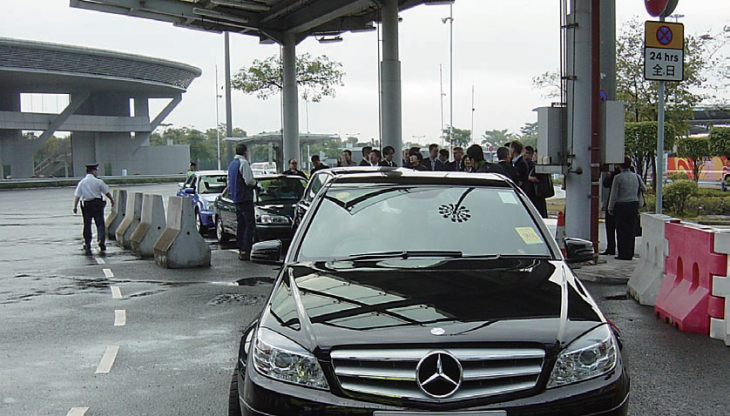 A trial scheme was launched in 2012 at the Shenzhen Bay Port starting with the issue of ad hoc quotas to qualified owners of Hong Kong private cars with seating capacity of 5 or below. An ATA Carnet is a customs document that permits the holder to temporary import goods specified in the Carnet to designated customs territories free of duty and may be exempted from certain customs documents, provided that the goods is re-exported intact. It is similar to a travel passport for the goods. 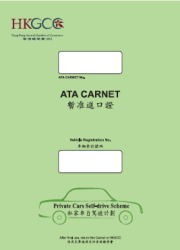 The General Administration of Customs of the PRC decided to use ATA Carnet as a part of its customs control for the Self-drive scheme. An applicant must be a registered owner of a private car that has been granted an Ad-hoc Quota under the Scheme. In case of a private car registered under the name of a company, the applicant must be an authorized driver of the company. Click onto for data input and obtain the required amount of guarantee. Upload supporting documents. Please refer to the supporting documents stipulated at step 3. (a) A copy of (i) Ad-hoc Quota, (ii) Closed Road Permit, (iii) Driver’s HK Identity Card and (iv) Vehicle Registration Document. Collect the Carnet at the Certification office in Admiralty. For the first time driver to the scheme, he should pick up the Carnet in person so that the Chamber staff can go through the use of Carnet in details with him. Applicants are obliged to pay application fees once an online application is approved. Fees paid to the Chamber are not refundable under all circumstances. Applicant agrees that the Carnet guarantee may be used to reimburse the Chamber for any duties, taxes, charges, legal or other costs and expenses should these be incurred and for any fees charged by the Chamber for the handling of the Carnet when discrepancy occurs. Applicant understands and agrees that a Carnet issued by the Chamber is not in itself an endorsement of the submitted information, nor a guarantee of its acceptance by China Customs. The China Customs has the right to accept, refuse or revoke any Carnet as it sees fit. The Chamber is not liable to any claims relating to the use of the Carnet. All information supplied to the Chamber by the applicant is true and correct. The applicant will be liable for prosecution under the laws of Hong Kong for making a false declaration. The holder must ensure to fulfill all the requirements asked by the relevant governments and authorities in order to enjoy the Scheme. The General Administration of Customs of the PRC requires the Carnet holder to notify China Customs the temporary importation of the private car in a specified electronic means in advance. 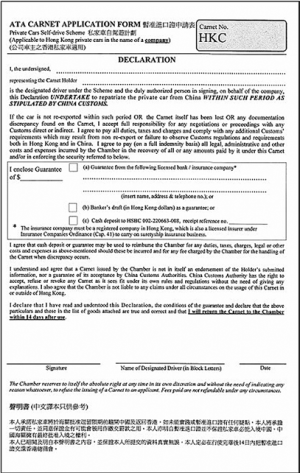 Carnet holder may request the Chamber to do it at a fee. The holder is advised to keep a copy of the Carnet for record. The Carnet number should be referred in all communications with the Chamber. When collecting the Carnet, he should inspect the Carnet to ensure that all information therein is correct: 2 counterfoils [a yellow (S1) and a white (S2)]; and 4 vouchers [a pair in yellow (F3 & F5) and a pair in white (F6 & F8)], and an authorization letter (for company holder only). For queries, please resolve it at once before leaving the Chamber’s counter. Once the Carnet is collected, it is deemed to have agreed that the document has been correctly issued with no missing pages. It is the holder’s responsibility to check carefully that all counterfoils and vouchers have been correctly processed by customs. Any documentation discrepancy found on the Carnet may result in claims. (a) The holder must sign the green form (F1A) on the left hand side of the folder before using the Carnet. (b) When leaving Hong Kong, the holder must ensure the green form (F1A) and the yellow counterfoil (S1) on the left hand side of the folder have been stamped and signed, while the yellow voucher (F3) on the right hand side has been taken away by Hong Kong Customs. (c) When entering China, the holder must ensure the white counterfoil (S2) on the left hand side of the folder has been stamped and signed, while the white voucher (F6) on the right hand side has been taken away by China Customs. 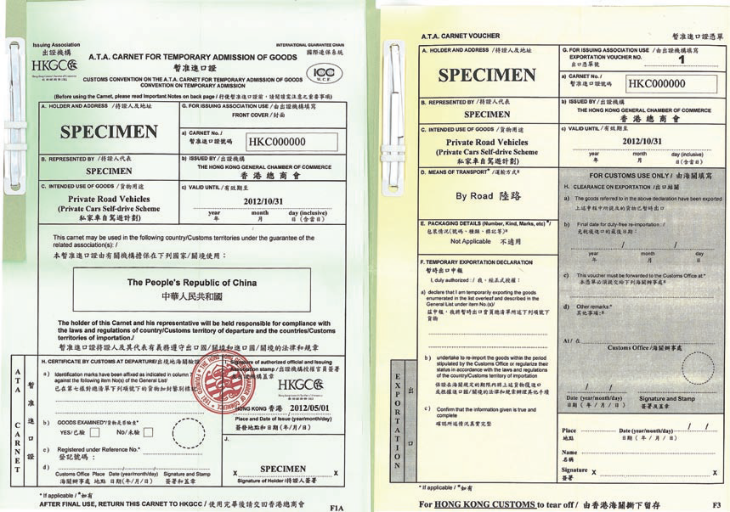 (d) When leaving China, the holder must ensure the white counterfoil (S2) on the left hand side of the folder has been stamped and signed, while the white voucher (F8) on the right hand side has been taken away by China Customs. (e)When returning Hong Kong, the holder must ensure the yellow counterfoil (S1) on the left hand side of the folder has been stamped and signed, while the yellow voucher (F5) on the right hand side has been taken away by Hong Kong Customs. The holder is required to return the Carnet to the Chamber for the discharge of guarantee within 14 days after use. Subject to no irregularity found, the guarantee will be normally returned to the holder within 14 working days. Failure to return the Carnet or return with discrepancy is considered an irregularity. Regularization of any irregularity may result in claims and may involve payment of customs duties, taxes, penalties and/or additional compliance requirements by China Customs. The guarantee will be withheld until the claim is completely settled. An administration fee of HK$250 will be charged for any regularization action taken by the Chamber. A Carnet is valid for 6-month for a single entry to China. The holder must observe the date for Re-exportation given by China Customs as indicated on the Carnet. In case the car is lost or damaged in China, the holder is required to report to China Customs before leaving China. 22/F United Centre, 95 Queensway, Admiralty.